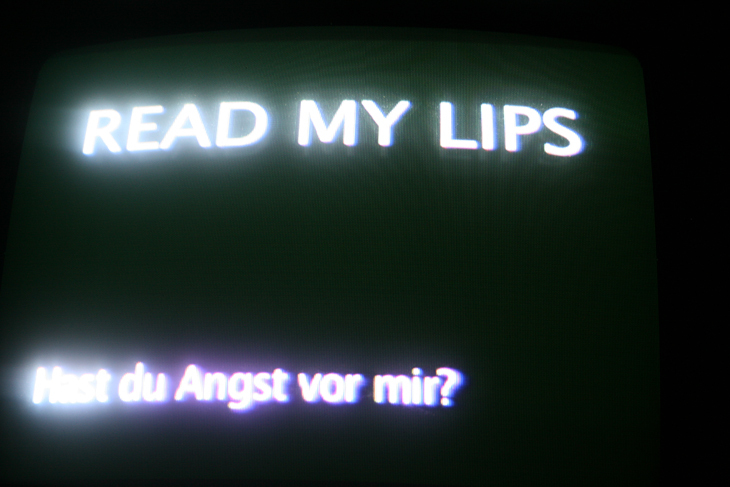 Read my Lips is a literal invitation to the viewer to participate in an interactive video installation. The public are invited to re-dub, a collection of Hitchcockesque scenes in which the original German film dubbing was used as a method of censorship. The work includes film scenes from Spellbound (USA 1945) Dir. Alfred Hitchcock, Notorious (USA 1946) Dir. Alfred Hitchcock and Homicidal (USA 1961), William Castle. The omnipotent ‘big I’ arises in all of Kerstin Honeit’s work. 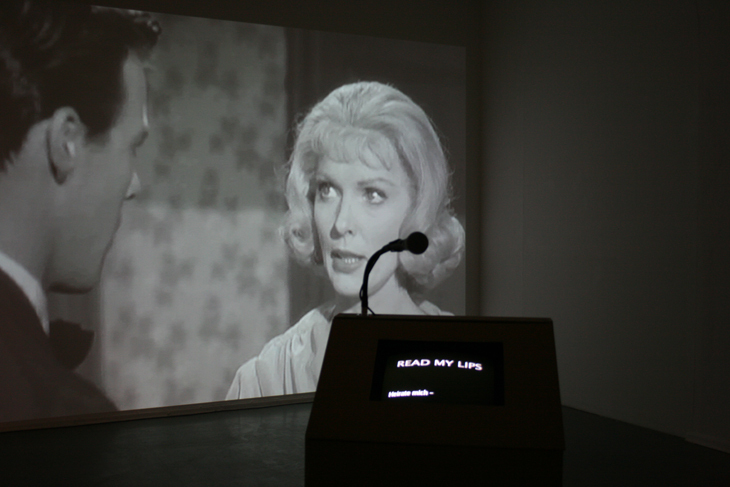 In her interactive video installation Read My Lips (2009), ‘the big I’ has transformed itself into a black box. A black and white video within this black box shows four scenes from Hitchcockesque films. Opposite the screen is a lectern with a microphone and a teleprompter, which the viewer is invited to use. The viewer becomes the dubbing voice and without the use of their own voice the film remains silent. Occasionally, the subtitles in the teleprompter light up. It is here that Christina on Braun's ‘the small i’ comes into play; the ‘i’ that embodies incompleteness. How can ‘the big I’ be formed through the many manipulation possibilities of the dubbing process? Honeit demands the viewer to look carefully. If the viewer is able to master the art of lip-reading, they have the advantage of understanding more. From a cultural historical standpoint, Honeit’s chosen film sequences are the antithesis of a distorted post-war history. The Hollywood protests against Germany’s Nazi past on the one hand, and the revised German version on the other; a manipulation that the falsified dubbing brings to the surface, and the simultaneous confrontation of the gender stereotyping of the 1940s. Kerstin Honeit plays with these roles on the screen and asks ‘the small i’ to perform the story.